Yet another year of collecting successes and disappointments has come to an end, but as has become a tradition, we can’t say a complete goodbye to 2010 until we’ve had the 2010 AFB Toys of the Year Awards. The toys listed below come from what I personally have bought / reviewed over the course of 2010, so it’s limited to my personal tastes and collection, but as I seem to have wide and eclectic tastes and like to give most lines at least a try, that leaves a lot to work with. Lets get the ball rolling! The Under 6” Line of the Year: Hasbro’s Iron Man 3 ¾” Scale Line: If this was based solely on character selection, I’d still keep it in the Hasbro family but would probably go with the Secret Wars 3 ¾” line of two-packs, which was a great trip down memory lane, but the quality control on those figures was just too haphazard to give it the gong. Instead, I’m choosing the Iron Man Comic line, which not only has given us a great range of Shellhead’s armour in small scale, but some other fun characters as well, like Titanium Man, Crimson Dynamo and Mandarin. I’m hopeful that the movie tie-in lines for 2011’s Thor and Captain America films will have similar comic-based lines to make us collectors happy! The 6” (or thereabouts) Male Figure of the Year: DC Universe Classics Wave 12 Iron Figure: This was a hard choice for me, as there were a number of figures I really loved this year, but I’ve chosen Iron for two reasons: first because he’s the first member of the amazing Metal Men to come to life in DCUC, and secondly (and most importantly for the purposes of this post) because he was done so damn well! Not only did the Four Horsemen give us some clever attachments to represent Iron’s powers (gotta love that wrench! ), they also gave us a “metal” looking figure with a comic-accurate blue tinge! Brilliant. While Iron took the cape, I also thought DCUC Wave 11’s Steppenwolf (comic accurate version) and DC Direct’s Blackest Night Larfleeze figures were brilliantly done. The 6” (or thereabouts) Female Figure of the Year: (tie) Masters of the Universe Adora and DC Direct Battle for the Cowl Batgirl: I really can’t separate these two fantastic figures. Adora is perfectly captured as a character by Mattel’s effort, while the Stephanie Brown version of Batgirl’s new costume gets a gloriously detailed debut in plastic which is happily in scale with DCD’s earlier Batman figures, creating display happiness. Totally different figures with one thing in common – they both show DCUC’s stick-armed females what happens when you eat a proper diet! The Build-A-Figure of the Year: DC Universe Wave 13 Trigon: I’m delighted to see Ultra-Humanite and Validus in plastic form, and brilliantly done, and was surprised by how much I liked DCUC Wave 12’s Darkseid, but Trigon is the winner for me because he’s something totally different from what we’ve seen in other Collect and Connect figures in the DCUC line – a new sculpt which hopefully can be put to good use in the future. That cloth cape is just icing on the cake! 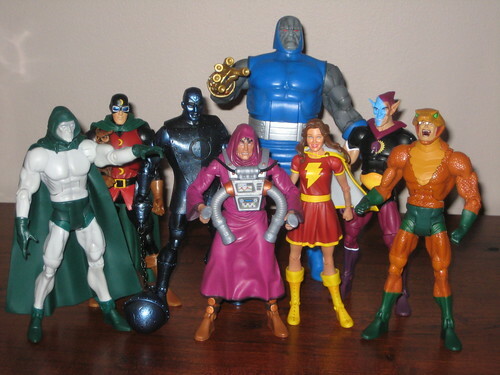 6” Wave of the Year: DC Universe Wave 12: Wave 12 didn’t just have the amazing Iron– it had a great range of characters without any obvious “anchor” that showed just what this line is about. It also had some real Golden Age / JSA love, and having Spectre and Doctor Mid-Nite in one wave, plus standout renditions of Eclipso and Copperhead all makes more than enough to make this the year’s favourite for me. Honourable mention: DCUC Wave 15– Validus, Starman, Jack Knight and OMAC made up the highlights of an almost equally awesome wave. The Over 6” / Under 18” Figure of the Year: Marvel Select Abomination. Marvel Select’s star is really on the rise, and it was never shining brighter this year than when Abomination made his debut. This thing was not just heavy and huge, but still easy to pose, and this combined with his scaly skin and the sinister smile on the headsculpt made a truly outstanding piece. Marvel Select’s Thing and Mattel’s MOTUC Battle-Cat (not quite a figure, I know) were close seconds. 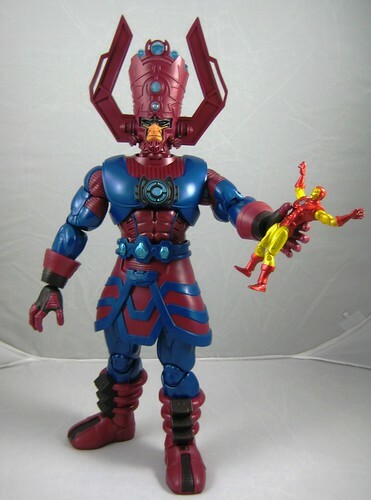 The Over 18” Figure of the Year: Marvel Universe Galactus. I did love DC Direct’s 13” Alan Scott figure, but there’s just no contest here. Galactus isn’t just huge and articulated – he lights up! Just an amazingly fun piece, and a perfect centre for a groovy Marvel Universe display! The Bust / Mini-Bust of the Year: Bowen Designs Pyro Mini-Bust: Bowen had a cracker year, and got a good chunk of my collecting dollars. I loved their efforts with characters like Longshot and Arcade, but it was another supporting X-Character, Pyro, that took the cake for me this year. The amazing arc of flame is obviously an amazing feature, but it wouldn’t mean much without a fantastic likeness, which has been more than truly achieved. Honourable mentions would go to DC Direct’s Batigrl Bust from the Amanda Conner-inspired wave of the Women of the DC Universe series and the DC Direct Bizarro Bust from the Gary Frank-based wave of Heroes of the DC Universe– both very fun stuff! 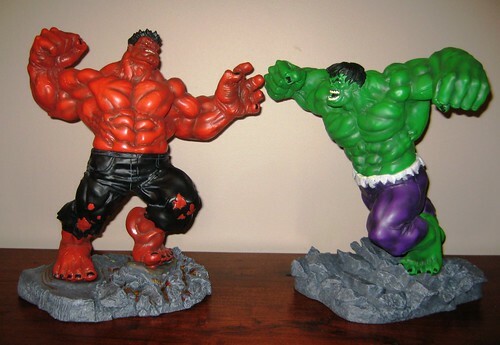 The Statue(s) of the Year: Kotobukiya’s Fall of the Hulks Green Hulk and Red Hulk Statue Set: I was never a Hulk fan until the “Red Hulk” storyline drew me in, and when I saw this fantastic set I knew that it needed to be mine. Getting these huge pieces to Oz incurred a hefty shipping bill, but it was worth it – these were brilliant on their own and together they were just amazing. They’re sure to be prominently displayed in my collection for years to come. 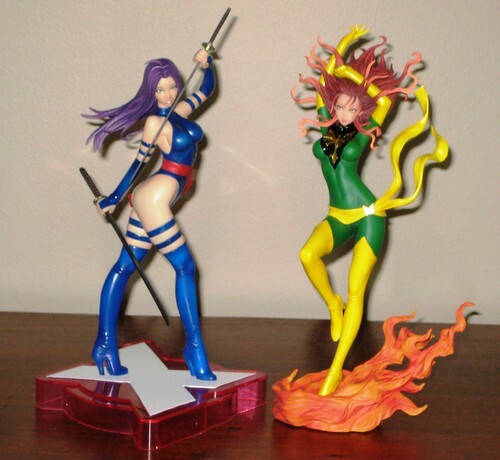 The Statue (Series) of the Year: Kotobukiya’s Marvel Bishoujo Statue Series: I started off on this series with Rogue at the beginning of the year, and have enjoyed each subsequent purchase even more – Scarlet Witch, Psylocke and Phoenix are all brilliant and I’ll be reviewing Emma Frost shortly. Easily my favourite statue-based line to collect during 2010 – I just wish Koto had better Australian distribution to make it a bit easier! Honourable mentions go to DC Direct’s Batman Black and White and DC Dynamics Series. And finally…. the WTF? Award for 2010 goes to: Mattel’s Public Enemies Series. This award normally seems reserved for poor old DC Direct, but to me, releasing these figures in an animated style and robbing collectors of comic accurate versions of Brimstone, Silver Banshee, Icicle and Major Force was the boneheaded move of the year. A boo and a hiss to Mattel for that one! And that’s a wrap! Remember, this is just one person’s set of opinions – if you agree, disagree or want to post your own list, then visit the AFB Forum’s 2010 Toy of the Year Thread and have your say. Also, don’t forget you can comment on this post to enter the January AFB Comment of the Month Contest! 2010 was a good but busy year for me – I’m hoping to have more time to focus on my collecting and blogging in 2011, and am looking forward to the year ahead. Thanks for being a part of the AFB world this past year! Some great choices Andy. Nice wrap-up. At least they got Iron's color scheme right. More than HeroClix did. haha its good to know that i'm onto something with the stuff i buy. Was a good year IMHO (for buying stuff anyways). nice picks for awards. have to agree on iron and Galactus. and Trigon does make a nice baf. other then his white cloth cape. Andora as best female figure have to disagree for one the mold made her come off looking like she ate too many doughnuts.